Under state law, North Carolina residents are eligible for a lower tuition rate to state universities, including the University of North Carolina at Chapel Hill (the University). In order to qualify as a resident for tuition purposes, a person must have established legal residence (or domicile) in North Carolina and maintained that legal residence for at least twelve (12) months prior to his or her classification as a resident for tuition purposes. Each student is classified as an in-state or out-of-state resident upon admission. If you believe that you qualify as a North Carolina resident for tuition purposes, you may apply for in-state resident status by following the instructions provided by your admissions office. Continuing students who believe they may now qualify as a resident for tuition purposes may apply through the North Carolina Residency Determination Service (RDS). 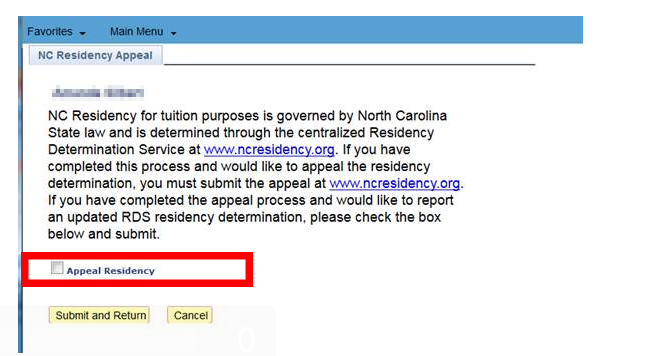 Undergraduate students who are claiming North Carolina residency for tuition purposes, are required to submit a residency application with the North Carolina Residency Determination Services (RDS) at www.ncresidency.org. If you have not previously gone through RDS, contact your admissions office for information on completing your RDS application and providing a Residency Certification Number (RCN). If you are claiming North Carolina residency for tuition purposes, follow the instructions in your application for admission. For additional information, contact your admissions office. Please see the North Carolina State Residence Classification Manual for an illustrative list. Review the benefits of several residency classifications. Please take note of the Residence Application Deadlines. Residency applications submitted through RDS after the deadlines listed below will not be eligible for updates for the term. Importatnt: Click to view a list of application forms to include with residency applications. You must submit supporting documentation with your application. Please include any and all documentation that may illustrate how you have established residency in North Carolina. The North Carolina State Residence Classification Manual provides an illustrative list of the kinds of information and conduct that may be considered as evidence.